You want a bike that goes up efficiently and still descends like an animal. One that you don’t have to worry about flipping switches on just to continue your ride. Evolved from its predecessor’s highly-regarded descending characteristics, the all-new Process 153 is stiff, smooth, and an absolute rocket. Designed to be lightweight and built to demanding standards. The Process 153 is built around a durable 6061 Aluminum frame and features the Beamer Independent Suspension Design. Built to be off-the-top progressive, Beamer Independent Suspension helps the bike stay higher in the travel and recover from hits quicker. The Process is instilled with what Kona product managers like to call “pure shock movement,” whereby the shock is protected from side load. Designed to be highly tunable and extremely durable. The Process 153 AL/DL 29 is an incredible bike with an elite level build kit. A Rock Shox Yari fork and Deluxe rear shock provide a supple and smooth ride, the SRAM GX Eagle 12-speed drivetrain provides all the gears you need to make it up the steepest climbs, and SRAM GUide brakes provide incredible stopping power when descending steep chutes. If you are looking for a bike that can handle everything you want to ride, the Kona Process needs to be your next bike. From fast flowy single track to steep rocky chutes and everything in between, the Process is ready to handle it all. Push your riding further and attack the trail with more confidence than ever before. Kona 6061 Aluminum Butted construction creates a lightweight frame that can withstand the rigors of All-Mountain riding. I started seriously mountain biking last year after a long break. My previous bike was a XC bike with 26" tires. This bike is several pounds heavier than the old bike but it climbs better and is more maneuverable. 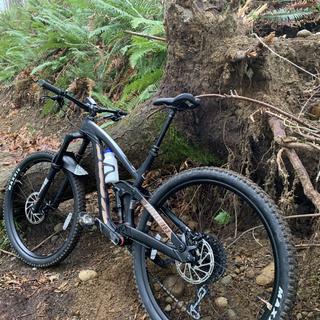 I thought the 29er would make it hard to get through tight turns but I was wrong. The bike is so nimble. My climbs are faster, my descents are way faster, and the fork absorbs all the roots and rocks so much better than my old bike. I don't end a ride with my arms tired from the shaking. I bought a large. I'm 5'11" with a 30" inseam, the bike fits perfectly with the dropper post full extended but all the way down. It was as easy to put together as Jenson said it would be. Took me only a few minutes to get it riding. Make sure you have a shock pump to get your suspension setup correctly. Rockshox has specific guides for each of the shocks which helped a lot, ignore internet advice, just follow the manufacturer guide. only problem I've head so far is that I can't get the tubeless stem to seal on the rear tire. I would recommend this bike to anyone. What’s the widest tire size you can run on this? BEST ANSWER: I'm currently running a 2.4 DHR II on a 30mm ID rim in the back and it just barely clears. I would say a 2.3 is a better choice, especially in wet conditions. Kona also said 2.3 is the widest because of how short the chainnstay is. Does the dropper post go all the way down in the seattube on a size large? We've confirmed that all sizes of this frame will accommodate the full length of the spec'd dropper. what is the weight of the medium size? We weigh all bikes across the spectrum of sizes to get a median weight. The median weight of this bike is ~34lb. Bigger sizes will be heavier and smaller sizes will be lighter than the median. Does the shock have any volume spacers installed? If so how many? Due to the fact that each frame and often each frame size can have different tunes, we are unable to verify this information for every bike. Generally, bike companies will tune the suspension to match that bike size's ideal rider. Meaning, small frames will be tuned for lighter riders while large frames are tuned for heavier riders. Often this is done with differing air cans or volume spacers, as well as various shim stacks and porting.